1 photograph : b&w ; 12 x 17 in. Item is a composite photograph of the Dalhousie University Arts and Science faculty and class of 1923. 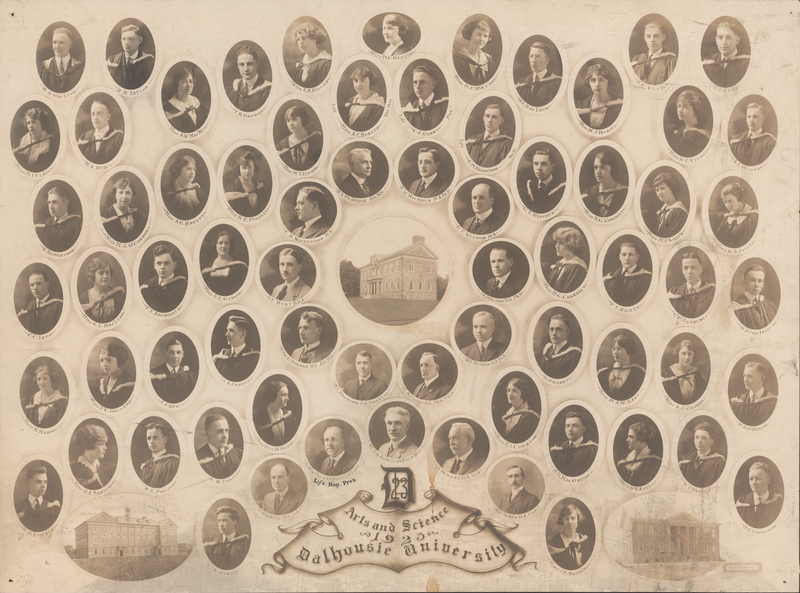 The photograph consists of portraits of Miss J. S. Schmidt; H. P. Jones; H. Murray; A. S. MacKenzie (President); A. MacMechan (Life Honorary President); M. Macneill; C. Kenty; D. S. Thompson; W. E. Moseley; Miss O. V. Atley; M. M. MacOdrum; Miss E. I. Crichton; H. L. Stewart; H. L. Bronson; Miss H. M. O'Brien; L. W. Fraser; W. F. Proctor; Miss H. A. Sandford; M. B. Emeneau; Miss M. Marshall; Miss F. C. Holland; J. Chew; J. A. Forbes; R. MacG. Dawson; H. F. Munro; D. M. Grant; Miss M. McKay; Miss D. J. Graham; H. D. O'Brien; C. C. Ives; Miss G. L. MacLean; F. F. Archibald; Miss E. E. Geddes; B. C. Hunt; J. A. Dawson; Miss M. G. Crandall; P. T. Hickey; C. P. Bethune; W. B. MacOdrum; H. Robertson; Miss M. J. O'Connor; Miss A. G. Harvey; Miss H. E. Pugsley; Miss M. I. Kuhn; C. B. Nickerson; D. S. McIntosh; E. W. Nichols; G. F. Wilson; Miss A. F. Hunter (Life Vice President); C. F. Grant (Life President); G. M. Morrison (Life Secretary); G. E. Misener; Miss M. G. Wambolt; Miss M. J. Smith; Miss K. S. Foster; Miss M. I. Clark; H. C. Muir; N. B. MacLeod; R. B. Taylor; Miss A. W. MacNeil; T. R. Goudge; Miss E. A. Killan; Miss M. C. Hawkins; Miss M. F. McCurdy; D. S. MacLeod; Miss M. J. Moase; H. C. Glube; Miss R. E. Cluney; A. E. Murray; and R. Kerr arranged around photographs of three buildings. Photograph is faded and has several marks and smudges on it. There ar pin holes in the corners and a small tear on the right edge.